A review of “Don’t Let the Pigeon Drive the Bus”, a production by the UK-based Big Wooden Horse Company. Written for local family portal Little Day Out. What do you do when a (not so) charming, (not very) agreeable, and extremely persuasive Pigeon asks you to let him drive the bus? 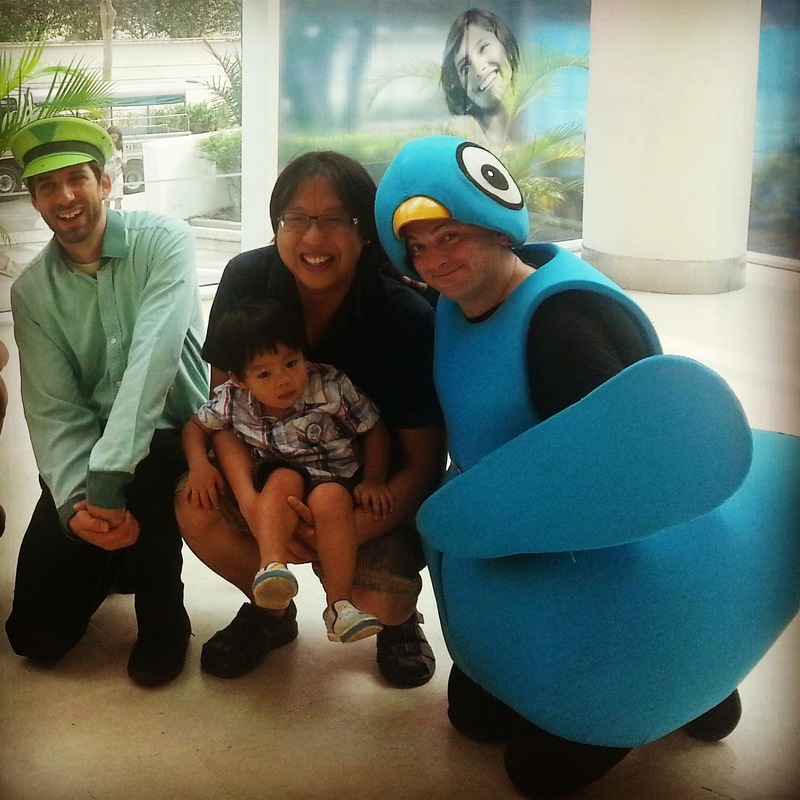 That’s the premise of this simple play, which was based on a popular series of books by American writer Mo Willems. But while the storyline behind the play is simple, the production is far from simplistic. Big Wooden Horse’s Artistic Director Adam Bampton-Smith drew on the original elements present in the book, but took the content one step further. For instance, Bampton-Smith added to the characters of Pigeon and Bus Driver, and there are now other figures such as the Hot Dog Man and the Truck Driver, which add to the diversity of the adult figures in the play. There is of course the very likeable character of Duckie, who won this reviewer’s heart for being wise yet simply adorable. In terms of stage sets, “Don’t Let the Pigeon Drive the Bus” was extremely creative and effective in its use of movable blocks to construct and deconstruct props such as the park bench, pet cat (also known as Mr Tickles), and even the actual bus itself. When presented against delightful backdrops of luscious park trees and even a huge glowing star, the audience of mainly children were transported into the believable world created by Pigeon and the Bus Driver. Audience engagement was clearly a hit for this show. One might be mistaken into thinking that the children in the audience have a limited vocabulary. The experience of this reviewer was that throughout his entire time in the theatre, that there seemed only to be a single word “No!” being shouted from the lips of every child in the crowd. 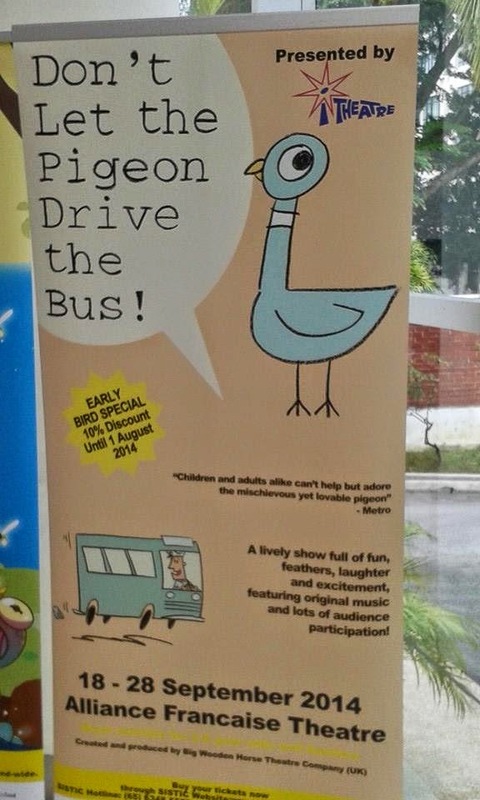 In all, “Don’t Let the Pigeon Drive the Bus” is a delightful play for young children. The songs and dances were outstanding. In particular this reviewer loved the song “Pigeon at the Wheel”, which conveyed the playful aspirations of Pigeon in his attempt to drive the bus. There were also sufficient “learning points” to keep this reviewer happy; for instance children were taught the importance of obeying authority and in sharing with their friends. There was also an interesting twist at the end which helped the children to implicitly learn concepts of role reversal and how not to always be rigid in their thinking. The proof of the pudding is in the eating. How did this reviewer’s 2-year-old son E respond to the show? Well, given that it was E’s first musical, it seemed he enjoyed the production thoroughly. The little boy was observed staring at the characters intently with his thumb comfortably wedged inside his mouth. And when it was time to leave, this reviewer found his son fast asleep. He had apparently been lulled to sleep at the closing lullaby tunes. What an eventful outing for the young child! Don’t Let the Pigeon Drive the Bus! is now in the theatres and will run till 28 September. It is recommended for families and specifically for those aged 2 to 8. Please refer to this page for our Behind-the-Scenes interviews with the Artistic Directors of Big Wooden Horse Company and I Theatre.